This paper examines how freedom of transit and transit facilitation are addressed in trade and transport (as well as transit-specific) agreements in the ESCAP region. The objective is to identify good practices and understand the extent to which existing agreements meet the transit facilitation provisions set out in the draft text of the WTO trade facilitation agreement (TFA). 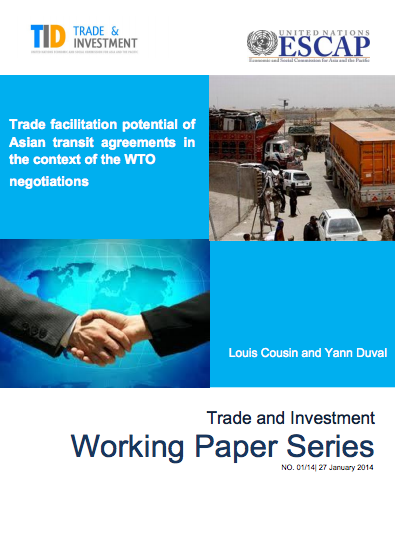 Following an overview of the provisions on transit found in 153 preferential trade agreements involving ESCAP countries, the study provides a more detailed analysis of a sample of 19 international transport and transit agreements in Asia in terms of their trade facilitation potential. Although some useful provisions for transit facilitation considered during the WTO negotiations did not find their way into the final TFA, the text agreed in Bali strengthens the basis for implementation of freedom of transit in the Asia-Pacific region. At the same time, the analysis highlights the complexity of the existing legal environment for transit and suggests a need for further enhancing inter-agency coordination and strengthening of multilateral rules in this area, building on the good practices found in many existing bilateral, regional and multilateral instruments.